Sporadic manually-gathered relative-humidity (RH%) sample data for 16WW. A sparse and ad hoc set of manual temperature and relative humdity measurements, now finished. It was collected before OpenTRV's RH%-measuring TRV1s were in place. The OpenTRV devices gather data automatically every few minutes from most rooms. Note that exterior temperatures and RH% may be directly measured. They may also be approximated from (often conflicting!) local weather reports. This data is licensed under CC0, ie effectively public domain. If you make use of this data, attribution is nice but not obligatory. RH is % relative humidity. 2010/09/13 16:45Z 22 67 22 63 21 65 21 66 23 78 Dull and chilly and spotty rain outside. 2010/09/15 18:00Z 21 83 Warm bath in progress. 2010/12/24 14:45Z 15 73 In small bedroom after running dehumidifier ~2h: 15°C, ~50%RH. 2011/12/21 12:50Z 16.8 75.6 Immediately after completion of installation of MHRV in bathroom, after the windows have been open all morning on an overcast and damp day. 2011/12/21 17:43Z 15.9 85.2 With six people in the house (including two small children running around) and some cooking, the fan cut in, so I adjusted it a little so as not to come on until ~85%RH. 2011/12/21 18:41Z 18.0 92.9 Bath run, children in it, fan on boost, and RH staying below 100%, so no condensation on mirrors, though some on the window. After a few minutes the RH was dropping a little (to ~90%) and the temp rising (to ~18.4°C). 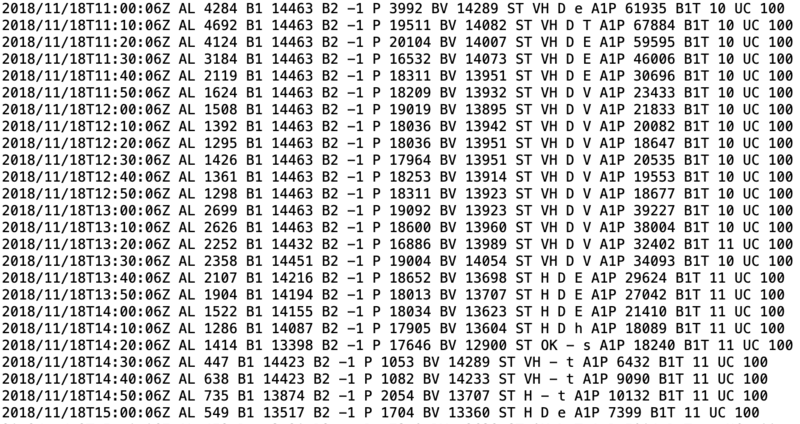 2011/12/22 09:30Z 19.9 81.7 Fan has been running for a few minutes after being completely off all night; no windows open. 2011/12/22 12:41Z 17.4 79.2 External air temp ~15°C, fan running on low, central heating off. 2011/12/22 13:44Z 17.3 77.3 Fan running on low, central heating off. 2011/12/22 18:51Z 17.7 83.8 Fan running on low, supper finished (ie cooking), external RH ~85%. 2011/12/23 07:30Z 16.7 86.3 11 Fan running on low all night, ~11°C outside, some (but not much) condensation on bedroom windows. 2011/12/23 15:00Z 20.1 >95 After an hour's hot bath with the fan managing to keep the room from customary steaminess. 2011/12/24 09:50Z 15.3 76.0 4 Fan running on low all night, ~4°C outside, some condensation on bedroom windows. 2011/12/27 13:30Z 13.5 73.1 House unoccupied since about noon on 24th, fan turned completely off at mains, external temperature ~10°C. 2011/12/27 19:27Z 17.4 65.3 Have had central heating on at ~16°C. 2012/01/06 12:00Z 16.2 80.4 7 76 Fan on low, incoming air 14.7°C; ~7°C and 76%RH outside. In small rear bedroom (boy's) at 12:40, 17.2°C and 71.4%RH. 2012/01/06 15:30Z 15.8 79.0 8 80 Fan on low, incoming air 14.9°C; ~8°C and 80%RH outside. 2012/01/13 11:30Z 14.6 64.3 15.6 65.4 15.6 67.8 6 90+ (Outside humidity at least 90%.) Windows had been open while MHRV was being worked on; outside ~6°C and 90+%RH. Kitchen measurements an hour later with laundry drying on clothes horses but portable dehumidifier operating for an hour. Kitchen warmed up, because rad had been on when people in there, but RH fairly constant over next few hours and dehumidifier extracted a a decent glassful of water. By 4pm bathroom was up to ~77%RH but with temperature little changed. 2012/01/13 20:15Z 19.6 56.5 Kitchen warm, humidity low even after some cooking, etc; laundry reasonably dry. Dehumidifier running about 9h at 180W (as previously measured) or ~1.7kWh, and removed ~1.5l of water from the air. 2012/01/16 18:30Z 19.0 63.2 18.2 64.1 17.4 71.9 16.0 76.4 3 70 MHRV running again since early this morning, crisp and close to freezing outside all day, and dehumidifier was running in kitchen much of the day to contain moisture from laundry drying. Rear small bedroom at 16.3°C/70.3%RH. 2012/01/31 22:30Z 19.1 58 0 80 Had put heating up to ~19°C in all upstairs rooms for afternoon with room doors open to encourage air circulation. 2012/02/01 07:15Z 16.3 58 14.3 63 0 80 Had front bedroom window open a crack (and breezy all night outside) to encourage air intake there and flow to bathroom; much less condensation there and on other bathroom windows than normally expected with this external temperature. 2012/03/30 13:30Z 19.8 47.2 16 55 Has been warm and sunny for several days and we've had windows open during the day (and the MHRV off except at night). 2012/07/09 09:30Z 22.7 64.5 22.5 61.5 22.3 63.7 22.1 65.8 17 80 Some laundry drying in kitchen as damp and dark outside (has been a very wet three months) though internal %RH has been more typically 40--50. 2012/09/10 16:25Z 28.3 37.5 25 45 Sunny and warm, patio door open! 2012/10/12 18:25Z 20 62 20 63 20 66 10 73 Testing two new temp/RH displays; I don't trust any to better than +/- 1°C/1%RH but otherwise good! 2012/10/14 11:07Z 16 65 16 67 10 66 Now bright and sunny outside; had been near freezing overnight. After a long hot bath the bathroom temperature was up a couple of degrees, with the MHRV keeping humidity under some sort of control, ie walls not dripping, mirrors misting and unmisting; outside the condensate could be seen dripping as designed. 2012/10/28 16:21Z 14 66 14 70 9 88 House has been empty for a day, with outside temperatures between about 2°C and 10°C and heating had probably stayed off (was set at ~11°C as frost protection). MHRV has been on. Boy's bedroom 67%RH @ 14°C. 2012/11/26 15:22Z 17 72 18 72 8 88 New Vent-Axia Lo-Carbon Tempra just fitted in kitchen earlier today; laundry drying nearby (RH reading went up to 74% when laundry right next to meter). Dark and damp outside. Girl's bedroom 16°C and 75%RH; house was aired during fan-fitting work. 2013/04/05 17:12Z 18 40 19 39 18 40 18 40 9 44 Windows open for the first time in a while, given the sunshine. MHRV seems to have been consistently keeping RH in range ~50--70%. First published 2010-09-12 , updated 2019-04-22 , rebuilt 2019-04-23 . Site copyright © 2007-2019 Damon Hart-Davis. Hosted by ExNet.